Follow these tips to have a gorgeous spring display, year after year! • Plant most spring-blooming bulbs in October. Earlier than that and they’ll send out too much new growth; later than that and they may get not get established in time for cold weather. • Consider purchasing bulbs in September, before selection gets picked over. Choose only firm bulbs that are touted as “full-size.” Avoid bulbs that appear unduly shriveled, have little black spots on them, or have lost their "tunics," the papery covering on the outside. • Cheap bulbs so often sold at discount stores and big home box stores are undersized and won’t bloom well, if at all. This is the time to order at a reputable store on line (I like Breck's for selection and price) or a local garden center (Earl May, Holub's, etc.) If you want to save money, buy large amounts or buy pre-bagged mixes. • Good drainage is essential. Most bulbs are natives of gravelly mountain slopes. If they are planted in heavy clay or wet spots, they'll rot over time. Try to put bulbs in raised beds or slopes. To loosen the soil for good drainage, amend the soil heavily with compost, sand, and/or sphagnum peat moss. • Plant in full sun. Spring-blooming bulbs need lots of light to be their strongest. You can plant daffodils, crocuses, and other early-bloomers under trees since they bloom before the trees leaf out and shade t hem. groups of at least 8 for best effect. (And please avoid dreary little rows. They look stiff and skimpy.) 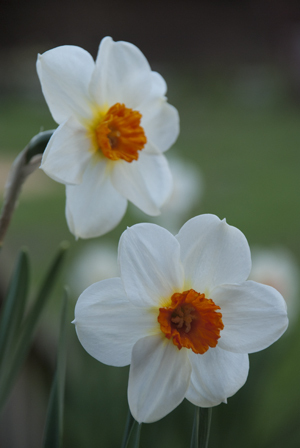 In fact, a planting of 20 or 25 daffodils or tulips is a knockout. Scattering the same number of bulbs around the yard just makes them look lonely and a little sad. • Plant pointed sides up and plant the depth specified on the label, measuring from the bottom of the bulb. • Forget about adding bone meal. It doesn’t have complete nutrients for bulbs and can attract animals. Instead, use Bulb Booster fertilizer or compost. • If squirrels and other digging animals bother your bulbs, cut a piece of chicken wire and place it so it will be an inch or so under the soil and block digging animals. The bulbs will grow up through the chicken wire. • Most spring-blooming bulbs will return each year and even multiply over time. But be aware that tulips and hyacinths look best their first year, less good their second, and tend to peter out in their third. Replace as needed. • Each spring, when bulbs at at their peak, jot down or take a photo of where you’d like to plant more bulbs in the fall. Otherwise, you might dig up existing bulbs to plant new ones!